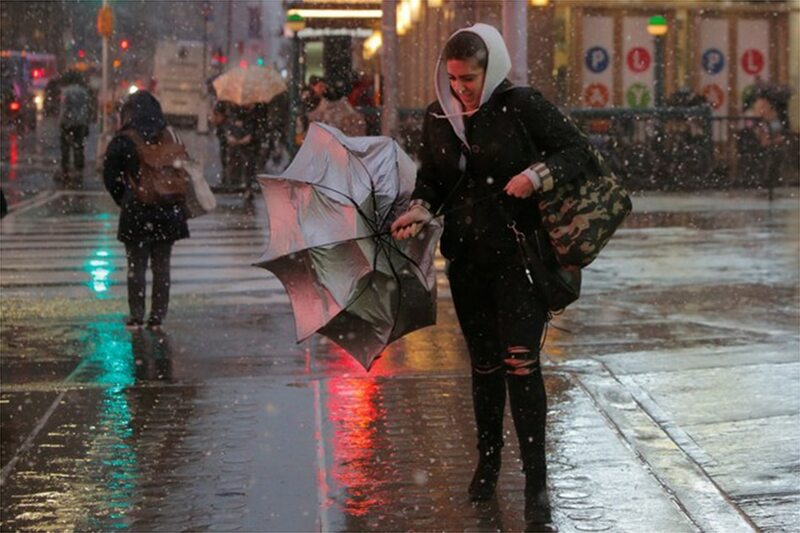 BOSTON - A powerful storm lashing the northeastern United States on Friday killed at least five people as winds topping 129 kms per hour helped flood streets in Boston, ground flights and halt train service across the region. Almost 1.7 million homes and businesses were without power in the Northeast and Midwest as the storm pummeled the East Coast from Virginia to Maine. Government offices in Washington closed as winds gusted to more than 96 kph in the US capital. The storm packed a deadly punch, with a falling tree killing a man in his 70s in Newport, Rhode Island, a police spokesperson said. Outside Baltimore, a 77-year-old woman was struck by a falling tree branch at her home near Kingsville, Maryland, a Baltimore County Fire Department spokesperson said. Private forecasting service AccuWeather said the storm dumped as much as 46 cms of snow on parts of New York state and Pennsylvania. Passenger railroad Amtrak halted service between Boston and Washington through Friday, and said it was suspending southbound service out of the US capital until at least Saturday morning because of downed trees on the track. Hayes said top wind speeds had been clocked at 134 kph in Massachusetts and Rhode Island and reached 125 kph at Etlan, Virginia.